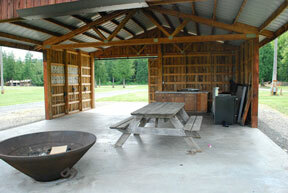 Located near the back corner of the camping area is the new barbeque area. 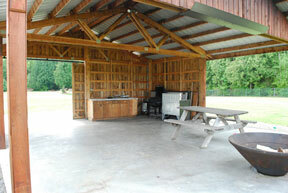 The covered area has a stove, fire pit, picnic tables and RV camping is available with rental. Check to see if the New BBQ is available for your rental date on our rental calendar here! $75 per day. RV camping is $30 per day/per site for hook up spots and $20 per day/per spot for dry camping.